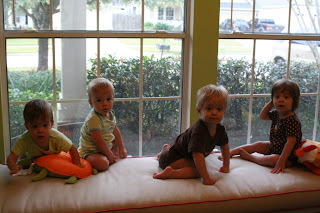 Goerlich Quadruplets: A New Playroom! What did the two photos from the previous post have to do with each other? Both rooms have been a mess lately! With the help of Grandpa's carpentry skills we turned our front sitting room/office into a playroom. We can now easily store and find all of our toys and our main living space no longer looks like a Fisher Price showroom. I love the window seat with the cubbies! What a great idea! Finishing touches look great! And I know they enjoy the bench with a view. I am sure they will have fun times in the new playroom. Much love. Whoa! 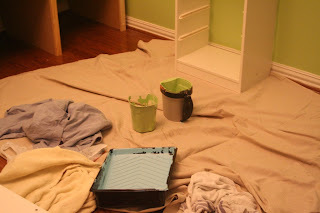 When are you coming to my house to redo my rooms? This is INCREDIBLE! GORGEOUS!!! 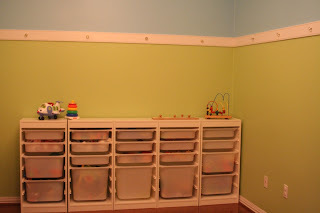 I want you to come redo my playroom too!! :) I'll babysit for as long as it takes!! Oh ! it look spectacular. I'm jealous! Suz said it about the bench/toy storage. So is he up for hire now!!! That is wonderful. Wow..it looks great and they look like they are enjoying it too!! Wow, it looks GREAT!!!! We can't wait to come play in it!! Thank you for your lovely posts throughout the year. Merry Christmas to you all. 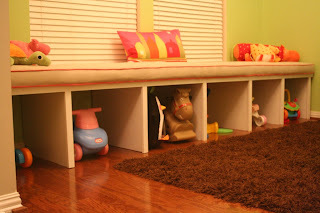 I love the cubbies under the window seat too! I love it. Send your dad my way and have him bring you too! Y'all did a great job! We need a place to store all our toys, especially the new riding ones! Hope yall had a wonderful Christmas. I love the playroom and I bet you can't keep the kiddos off that bench seat at the window...how perfect!